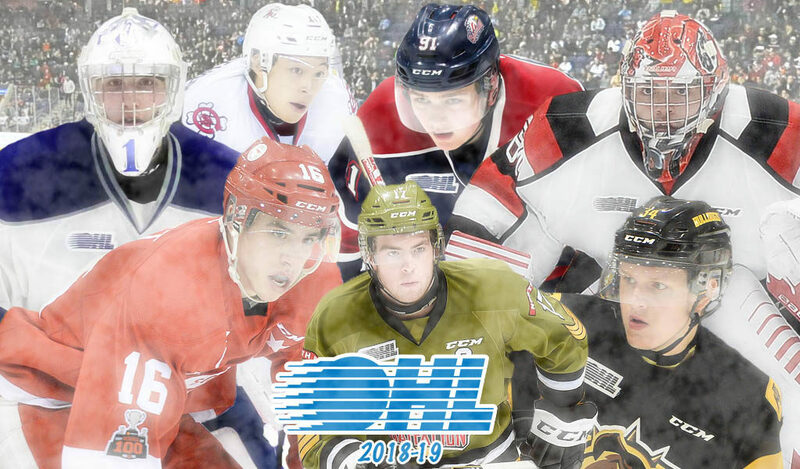 The 2018-19 OHL season is in the books, and with it a number of updated records from across the league’s 20 member teams. Here’s a look at some of the new statistical breakthroughs accomplished this past season. – Scored a club record 326 goals, the most by an OHL team since the 2010-11 Barrie Colts. – East Division champions finished with a franchise record 106 points to claim fourth Hamilton Spectator Trophy in club history. – West Division champions won a franchise record 45 games, finishing with a total of 96 points. – Set a new franchise mark with nine consecutive wins from Feb. 21st to Mar. 12th. – Isaac Nurse scored six seconds into the first period on Oct. 19th in Sudbury, setting a Hamilton Bulldogs all-time franchise record for fastest goal to start a game. Nurse eclipses the prior mark set by Belleville’s Mike Savage in Jan. 1984. – Jonathan Yantsis became the 11th player in Rangers franchise history to score three power play goals in a game on Mar. 15th against Owen Sound. – Jason Robertson joined Brendan Perlini (Jan. 2014) as the second player in Niagara IceDogs franchise history to score three power play goals in a game on Dec. 6th against Saginaw. – Jack Studnicka joined Perlini and Robertson as the third player in Niagara IceDogs franchise history to score three power play goals in a game on Feb. 21st against Kitchener. – Matthew Struthers scored just six seconds into overtime on Feb. 23rd as the North Bay Battalion defeated the Windsor Spitfires 4-3 on the road. Struthers’ winner set a new Battalion single game record for the fastest goal to start a period, eclipsing Evgeny Grachev’s 2008 mark of seven seconds. – Justin Brazeau tied a single game franchise record with seven points including three goals and four assists in an 8-3 win over the Kingston Frontenacs on Oct. 21st. His seven points match Wojtek Wolski’s mark from Jan. 2006. – Justin Brazeau recorded a hat-trick in a span of 10:12 on Sept. 30th in Oshawa, setting a new franchise record. His mark is 10 seconds faster than the hat-trick scored by Jay McClement in March 2003. – Sasha Chmelevski tied a franchise record with two shorthanded goals in an 8-1 win over the Hamilton Bulldogs on Feb. 15th. Chmelevski ties previous marks set by Bruce Baker (1974-75), Bobby Smith (1976-77), Shean Donovan (1993-94) and Alyn McCauley (1996-97). – Kevin Hancock tied a franchise record with two shorthanded goals in a 6-5 shootout loss to the London Knights on Nov. 3rd. Hancock joins other Attack and Platers players to accomplish the feat in Guy Larose (1985-86), Greg Jacina (2000-01), Bobby Ryan (2004-05), Nick Suzuki (2016-17) and Maksim Sushko (2017-18). – Chris Paquette tied a franchise record with two shorthanded goals in a 7-3 road win over the Ottawa 67’s on Sept. 23rd. Paquette joins past Petes to accomplish the feat in Scott Tottle (1983-84), Geoff Ingram (1988-89), Cameron Mann (1995-96) and Eric Staal (2002-03). – Cole Coskey tied a Saginaw Spirit record, recording six points in a 9-1 road win over the Flint Firebirds on Jan. 2nd. Coskey scored three goals and three assists to join Vincent Trocheck (Mar. 2012) as the second player in club history to put up six points in a game. – Barrett Hayton became the 11th player in Soo Greyhounds franchise history to score two shorthanded goals in one game, doing so in a 6-5 shootout win over the Windsor Spitfires on Nov. 18th. – Quinton Byfield scored eight seconds into the second period on Oct. 26th in Kingston, becoming the third player in Wolves history to do so to start a period. He joins Dan McCarthy (Sept. 1977) and Barrie Moore (Jan. 1992) in the Wolves record book. – The Otters won an OHL record 14 games beyond regulation, going 9-3 in overtime and 5-1 in shootouts. – Jamie Drysdale set a new Erie Otters points record for rookie defencemen, scoring the overtime winner in a 4-3 road win over the London Knights on Feb. 15th. Drysdale’s 29 points surpass the prior club mark set by Travis Dermott (2013-14). Drysdale finished his first OHL season with 40 points (7-33–40). – Isaac Ratcliffe scored his 50th goal of the season on Mar. 15th, netting a pair in a 5-2 win over the Erie Otters. Ratcliffe joins Ryan Callahan, Todd Bertuzzi, Jeff O’Neill and Mike Prokopec as the fifth player in franchise history to score 50 goals in as season. – Nate Schnarr recorded his 100th point of the season on Mar. 9th in Owen Sound. 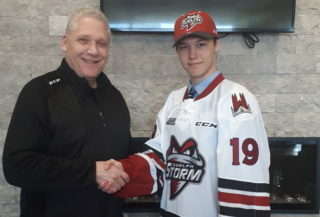 His is the 11th 100-point season in Storm history and the first since Scott Kosmachuk of the 2014 OHL Championship team. – Arthur Kaliyev recorded the first 50-goal season in Hamilton Bulldogs history, finding the back of the net on Mar. 2nd in London. – Arthur Kaliyev recorded the first 100 point season in Hamilton Bulldogs history, recording a pair of assists on Mar. 8th in Mississauga. Kaliyev finished the season with 102 points. – Jonathan Yantsis recorded his 50th goal of the season with four in a 9-3 win over the Owen Sound Attack on Mar. 15th. He is the first Ranger to score 50 since Jeff Skinner in 2009-10. The 50 goals are a 45-goal improvement from Yantsis’ five during the 2017-18 season. – Jonathan Yantsis finished with a league-leading 24 power play goals, the most by an OHL player since Barrie’s Brendan Lemieux scored 25 in 2014-15. They are the most power play goals by a Ranger since Nick Spaling’s 25 back in 2007-08. – Greg Meireles recorded the OHL’s longest point streak of the 2018-19 season that spanned 20 games from Feb. 2nd to Mar. 16th. It’s the longest point streak by a Kitchener Rangers player since Ryan MacInnis went 21 games in 2015-16. – Kevin Hancock joined the 50-goal club and recorded his 100th point on the same night, finding the back of the net in an 8-6 road win over the Kitchener Rangers on Mar. 1st. – Jason Robertson recorded his 100th point of the season with a pair of assists in a 6-4 road win over the North Bay Battalion on Mar. 1st. – Stephen Dhillon recored a Niagara IceDogs single season record 31st win on Feb. 23rd against the Peterborough Petes, surpassing Mark Visentin’s prior mark of 30 set in both 2011 and 2012. Dhillon won a total of 38 games on the season. – Ben Jones recorded his 100th point of the season with an assist in a 7-4 win over the Barrie Colts on Mar. 16th. – Akil Thomas recorded his 100th point of the season with an assist in a 7-4 win over the Barrie Colts on Mar. 16th. – Philip Tomasino set a new IceDogs franchise record with a league-leading 12 game winning goals, the most in the league’s most since Oshawa’s Michael Dal Colle scored 12 in 2014-15. – Justin Brazeau set a new single season franchise record with his 51st goal of the season on Feb. 24th in London. He surpasses Mike Amadio’s prior club mark of 50, ending the season with a total of 61 goals. – Justin Brazeau recorded his 100th point on Mar. 10th, putting up a goal and two assists in a 6-5 loss to the Peterborough Petes. – Anthony Salinitri led the OHL with seven shorthanded goals. He scored five of those as a member of the Sarnia Sting. – Tye Felhaber recorded his 100th point of the season, finding the back of the net in a 3-0 win over Mississauga on Mar. 3rd. He became the first 67’s player to hit the century mark since Tyler Toffoli in 2011-12. – Tye Felhaber scored his 50th goal in his 47th game of the season on Jan. 26th as the Ottawa 67’s defeated the Oshawa Generals 4-0. – Cole Perfetti set a new Spirit single season franchise record for rookies with his 29th goal on Feb. 23rd in Hamilton. He surpassed Jan Mursak’s prior mark of 28 by a rookie set in 2006-07. Perfetti finished the season with 37 goals, the most by a 16-year-old rookie since Windsor’s Taylor Hall in 2007-08. – Morgan Frost became the OHL’s first 100-point scorer of 2018-19 on Feb. 22nd in Kitchener. Frost’s second straight 100-point campaign makes him the first Greyhound to accomplish the feat since Richard Uniacke in 1996 and 1997. He finished the season with 109 points. – Ukko-Pekka Luukkonen set a new franchise single season shutouts record, recording his sixth on Mar. 9th in Hamilton. He eclipses the prior mark of five set by Franky Palazzese during the 2013-14 season. – Ukko-Pekka Luukkonen posted a franchise record 2.50 goals-against average, eclipsing the prior mark of 2.56 set by Patrick Ehelechner during the 2004-05 season. – Head coach Dale Hawerchuk earned his 300th career OHL victory on Feb. 2nd in a 3-1 win over the Mississauga Steelheads. 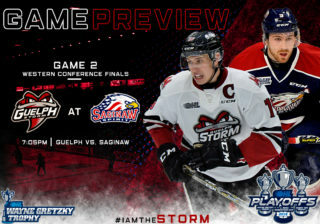 – Nick Suzuki recorded his 300th career OHL point on Feb. 18th, setting up a Dmitri Samorukov overtime winner as the Guelph Storm defeated the visiting Flint Firebirds 5-4. 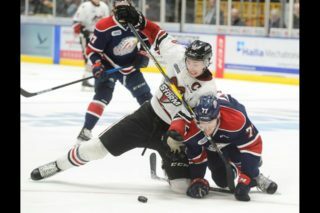 Suzuki, who recored the Owen Sound Attack franchise’s second-highest goal total of 129, wrapped up his 19-year-old season with 328 career regular season points. – Head coach Jay McKee earned his 100th career OHL victory on Jan. 27th in a 4-3 overtime road win over the Sault Ste. Marie Greyhounds. – Joseph Raaymakers became the sixth goaltender in OHL history to win 100 games on Jan. 24th as the London Knights took a 7-3 road win in Windsor. Raaymakers finished his regular season career with 109 victories, the third-most in league history. – Jacob Ingham set a new Mississauga Steelheads career goaltending wins record, earning his 56th victory on Feb. 17th in North Bay. His mark surpasses the prior record held by Spencer Martin (2011-15). Ingham finished his 18-year-old OHL season with 60 career wins. – Owen Tippett became the Mississauga Steelheads’ all-time franchise goal scoring leader on Nov. 18th, scoring twice in a 5-3 win over the Sudbury Wolves. He surpassed former record holder Darryl Bootland (1998-2002) with his 110th career tally. Tippett finished his Steelheads tenure with 114 markers. – Stephen Dhillon earned a franchise record 91st career win, posting a 31-save shutout on Feb. 23rd against the Peterborough Petes. Dhillon surpassed Mark Visentin (2008-12) for the most wins in IceDogs franchise history. He ended his OHL regular season career with 98. – Stephen Dhillon set a new IceDogs all-time franchise record, playing in his 167th career regular season contest on Dec. 29th in Kingston. He posted a 30-save shutout while passing Mark Vistentin (2008-12) to set the new benchmark. Dhillon finished his regular season career with 197 games played. – Michael DiPietro set a new OHL record, recording his 17th career shutout in a 4-0 blanking of the Peterborough Petes on Jan. 18th. DiPietro becomes the new league all-time shutouts leader, passing Tom McCollum (2006-09) to top the list. The Windsor Spitfires single season and career shutouts leader, DiPietro was the league’s Goaltender of the Year in 2018. – Kyle Maksimovich netted his fourth hat-trick of the season on Feb. 15th against the Hamilton Bulldogs, recording his 300th career point in the process. Maksimovich finished fifth in Erie Otters franchise scoring with 281 points in blue and gold. The fifth-year veteran finished his regular season career with 306 points over 320 contests. – Morgan Frost recorded his 300th career regular season point on Feb. 22nd in Kitchener. He ended his 19-year-old season with 310 career points, the sixth-highest total in Greyhounds franchise history. – Ukko-Pekka Luukkonen tied a Sudbury Wolves franchise record, recording his sixth shutout on Mar. 9th in Hamilton. He matches the career totals of Franky Palazzese (2012-14), Patrick Ehelechner (2003-05) and Mike Smith (2000-02). – Trevor Letowski earned his 100th career OHL coaching victory on Dec. 16th in a 4-3 overtime win over the Saginaw Spirit. 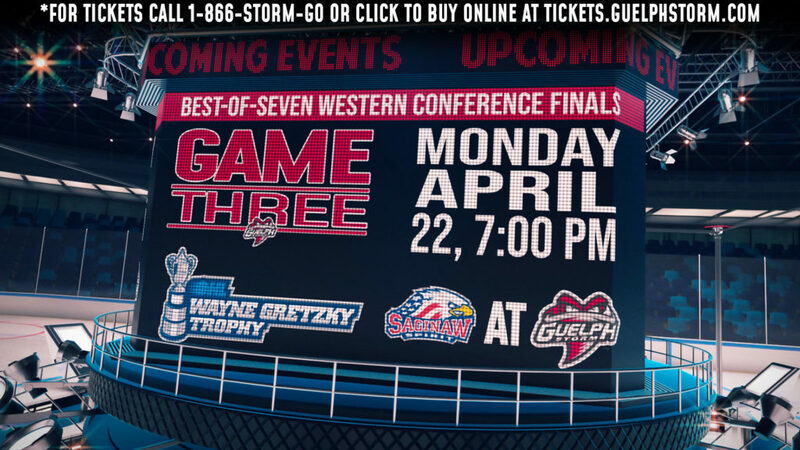 – Michael DiPietro became the winningest goaltender in Windsor Spitfires history in a 6-1 victory over the Owen Sound Attack on Oct. 28th. DiPietro’s 79th regular season win placed him ahead of Andrew Engelage (2006-09) on the Spits all-time list. He finished his Spitfires tenure with 86 wins.